August 30, 2012 - The U.S. 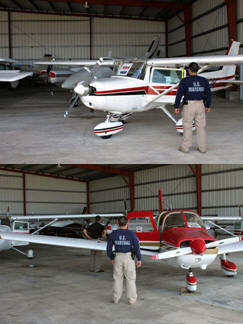 Marshals recently conducted a preview of six aircraft in Aguadilla that will be sold at public auction September 5 in Midland, Texas. The aircraft were part of a seizure conducted in December 2011 shortly after a search warrant was executed by the Drug Enforcement Administration in relation to the investigation of Santo Seda-Rodriguez. Seda-Rodriguez, owner and pilot of Jeshua Air Services, was the subject of an investigation by the Dominican National Drug Enforcement authorities as well as a federal investigation in the U.S., after 58 kilograms of cocaine were seized in an aircraft allegedly recorded under his name at the Americas International Airport in the Dominican Republic. The next day Seda-Rodriguez’s body was found in the Dominican Republic by local authorities, allegedly beaten to death. The auction will take place at the Midland International Airport in the Aeromod hanger at 2506 North Pliska Drive. The U.S. Marshals will sell the aircraft “as is,” and reserve the right to pull any aircraft from the auction at any time prior to the sale date without notice. “The U.S. Marshals Service plays a critical role by managing and selling assets seized and forfeited by federal law enforcement agencies nationwide,” said U.S. Marshal Orlando Rivera of the District of Puerto Rico. Proceeds generated from asset sales are used to compensate victims, supplement funding for law enforcement initiatives, and support community programs.